For most of us who were born and raised in a tropical country, we are sometimes oblivious to the presence of flowers all around us because they are there all year round. We can appreciate it anytime we want because there is no such thing as season for flowers. But when I started living in South Korea, the cold winter days deprive me of the sight of green luscious trees and colorful flowers. At the start of the cold days, all of a sudden, colors of nature do not exist. That is why at the start of the spring season, I always get too excited because finally, dead trees and dull colors will be replaced by green scenery and colorful flowers of different types and varieties. 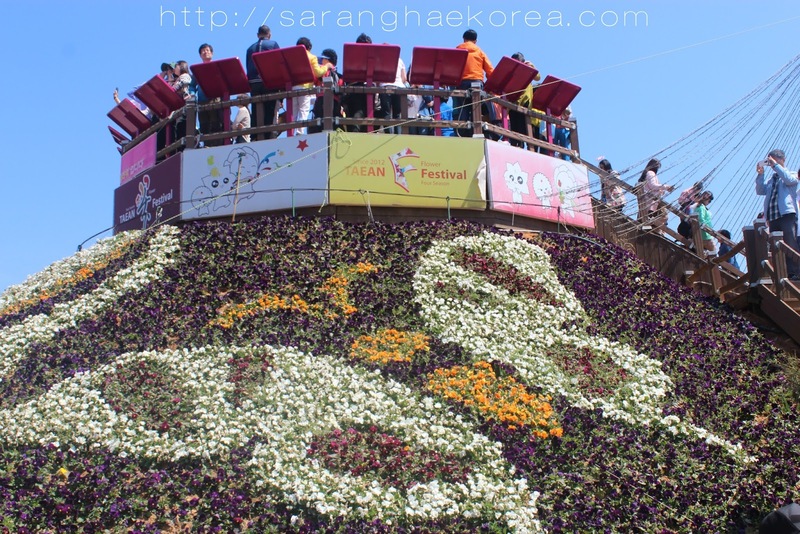 The change of the season from winter to spring is a symbol of festivity, and what better way to celebrate it than to organize various spring festivals. During springtime, there are festivals all over Korea like the Yeouido Spring Flower Festival and International Horticulture in Goyang, but if there’s one Spring Festival in Korea you shouldn’t miss, it’s the Taean Tulip Festival because it is recognized by the World Tulip Summit Society as one of the top 5 tulip festivals in the world, yes folks, we are talking about the world. 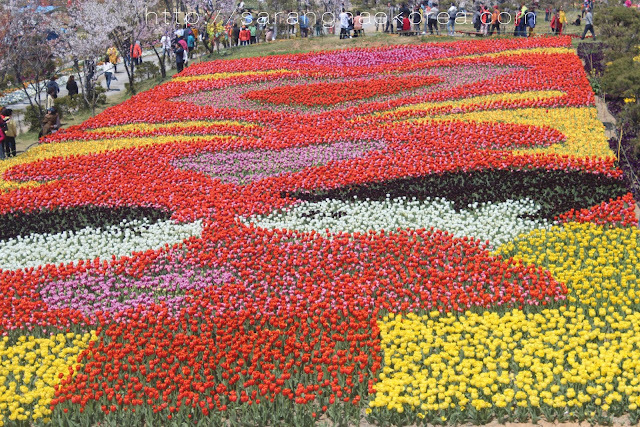 With over 1.5 million colorful tulips all over the garden, it has earned the respect of the world. At Taean tulips festival, you will see varieties of tulips that come in different colors and sizes. 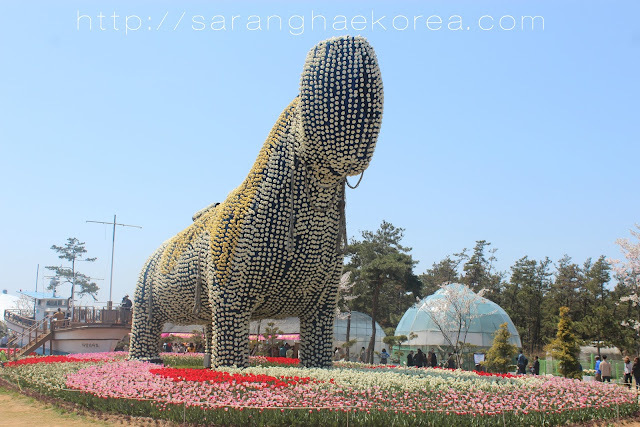 In a human height level, your eyes will show you a garden of thousands of tulips. They were planted according to variety and color. When put together, you will see a spectacular combination of tulips arranged neatly that it looks like the flowers are performing some sort of a dance especially when the wind blows them. It's such a refreshing sight to look at. Everywhere you go, there are tulips all around as if waving at every onlookers passing by. At some point, I was intrigued by how oddly they arranged the flowers according to colors. I decided to look at it on a higher perspective. They put up this mound in the middle of the garden, it looks like a little volcano for me, but not scary because of the flowers. People usually climb up to the peak of the mound to see the whole area. Looking at the beauties from up there, the odd arrangement of the colors made a little bit of sense to me. Some color formations are round, curve, straight lines and some were intentionally arranged to project an image. I was so sure that there’s a message behind the flower arrangement, some kind of an image which can only be appreciated at higher point of view. God knows what other images are projected by the arrangement of tulips in the Garden. I don’t have any equipment that could let me take photos at higher perspective, but I enjoyed the vast garden of tulips anyhow. I just thought that it really takes a lot of effort to come up with a magnificent garden like that, and with a concept. Aside from Tulips, the presence of Cherry blossoms planted at the corner makes the garden more magical. Although some petals have already withered, there are some remaining cherry blossom flowers enough to compliment with the colorful tulips. There are also digitalis, lupine, orchids, lilies and most of all, canola. There’s an area where all you can see are yellow beauties of canola flower. It was my first time to see a vast garden of canola in one area. There are also other activities in the festival like a mini concert. 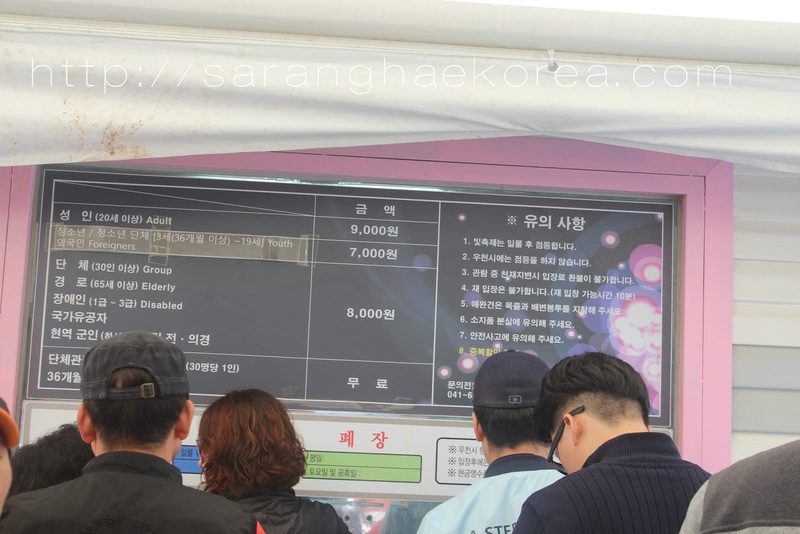 There are also food booths if you want to go on a food trip. Various Korean street food like ttokboki and hoteok are available. 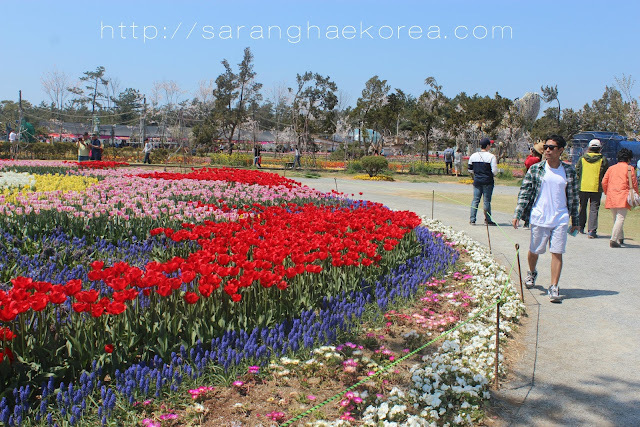 If you want to buy tulips seedlings, they have a market available for you. There are also souvenir booths where you can buy products like bracelets, jewelries, shirts, etc. They are not necessarily connected to Tulips Festivals, but people do buy anyway. Entrance to the Taean Tulip Festival is pretty cheap, you can check on the board below for the prices. At first I was intimidated to go there because they said it’s a very remote area. But I think it’s not that difficult to go there. You can take the express bus to Taean from any intercity bus terminal in Korea. Fare is based on the location where you are departing. Once you arrived at Taean Bus Terminal, you can take Bus Number 700 and get off at Sinon-ri. From there, you can walk around 10 to 15 minutes. The walkway to the garden is very narrow, you might need to be very careful walking on that road because you will be sharing it with a lot of cars. This year 2017, the festival will run from April 13, 2017 up to May 10, 2017.